Signed by 107 governments on January 27, 1967 in London, Moscow, and Washington D.C., the Outer Space Treaty sets forth the basic legal framework of international space law. It bars governments who have signed the treaty from placing weapons of mass destruction in Earth orbit, placing them on the Moon or any other celestial body, or anywhere in outer space. The treaty exclusively limits the use of celestial bodies (other planets, asteroids, and moons), including Earth's Moon for peaceful purposes only. It is expressly prohibited to test weapons or install military bases or installations. All governments who have signed the treaty explicitly agree to not lay claim to a celestial resource such as the Moon or a planet. The treaty states, outer space, including the Moon and other celestial bodies, is not subject to national appropriation by claim of sovereignty, by means of use or occupation, or by any other means. 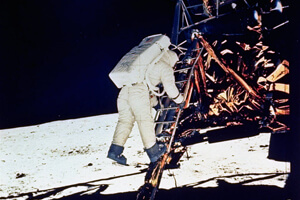 For those old enough to remember the first Moon landing, when Neil Armstron stepped onto the moon and planted a US flag, alarm bells rang around the world. Less than 60 years ago, when you planted a national flag you were claiming that territory for your homeland. Was the US establishing an American colony on the Moon? Claiming new territory has always been more of a European than an American practice. The Spanish, Dutch, French, Portuguese, and English created enormous expansive colonial empires around the world, including in the Americas. The legal concept that planting a flag established ownership and sovereignty became accepted throughout Europe and later around the world. However, prior to the first human Moon landing, the issue had already been settled. When the space race started, the United States realized that many people and nations around the world would strongly object to the United States claiming the Moon as a new colony and territory. It would raise new and important political issues in a time of great political turmoil. If the US claimed the moon, new international disputes would emerge that were harmful to everyone in the world. In short, neither Neil Armstrong, nor NASA, nor the United States intended to claim the Moon when they first planted a US flag on July 16, 1969. The issue had already been settled more than 2 years prior. The Outer Space Treaty was created in 1967 and later ratified by all space-faring nations. The superpowers of the era (the United States and the Soviet Union) both agreed that colonization on Earth in centuries past was directly responsible for enormous human suffering, armed conflict, and war. The two superpowers were determined to not repeat the past mistakes of Europe. The space race would not result in a land grab. So why did Neil Amstrong plant that flag? It was to honor America and its taxpayer who funded the extremely expensive project. It was also to claim victory over the Soviet Union in the space race. The Soviet Union may have beat the US by launching the first satellite into Earth orbit (Sputnik) and by putting the first man into space (Yuri Gagarin), but the United States was the first nation to put a man on the Moon. The mission also provided substantial scientific benefit. The United States and NASA had previously committed to sharing their scientific gains with the world. The moon rocks and soil samples that were brought back were shared with all nations to study and examine. Even though the two superpowers were in the middle of the Cold War, Soviet scientists were allowed to study lunar samples the United States brought back. Asteroids are other celestial bodies and covered under the Outer Space Treaty. But what about private firms (not governments) that are now developing plans to mine asteroids for rare minerals and elements? The Outer Space Treaty addresses establishing military bases, colonies, or claiming territory. It does not address exploiting outer space natural resources for commercial gain. This is a big debate that is currently ongoing in the international community, and there is no end in sight. Currently there are 2 major positions that are jockeying for supremacy on the world political stage. The United States and most members of the European Union hold the position that the Moon, asteroids, and other celestial bodies are global commons. This means each country should be allowed to let its private entrepreneurs (each licensed and monitored by their respective governments) go out into space and mine and extract what they can. It's very similar to current international ocean law, in regard to oil drilling or commercial fishing. A country cannot own the high seas, but a country can bring back fish or other natural resources they obtain out there. Other countries, including Russia, Belgium, and Brazil hold the position that celestial bodies belong to humanity as a whole. Any benefits derived from commercial endeavors should go to humanity as a whole. Sounds a bit like communism, doesn't it? How it all shakes out in the end is hard to foresee right now. But this is a major issue that will have to be addressed soon. Planetary Resources (a US-based company) launched a robotic miner into orbit (Arkyd-6) on January 25, 2018. The company is hoping to redirect the satellite to a near Earth asteroid by 2020. This miner is only looking for water (to be used as a space-based propellant in future missions), but it won't be long before missions looking to mine minerals and rare elements are underway.